Personalise your breathtakingly beautiful diamond creation with a special message on the inside of your wedding band. Shimansky is one of the only jewellers who offer a free engraving service once you’ve purchased a diamond jewellery item. 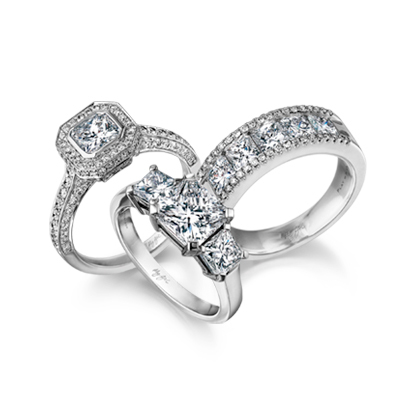 Let your significant other treasure the iconic diamond design for many more years to come. Planning to rejuvenate the beauty of your Shimansky engagement ring or any other jewellery item? We offer a complimentary cleaning service to help add more sparkle to your unique creation. Before you know it the fire, brilliance and scintillation of your one-of-a-kind jewellery piece will once again be even brighter than before. If you’re looking to resize your engagement ring or any other ring, our diamond experts are happy to assist. With our in-house diamond cutting and polishing workshop, our skilful craftsmen will make sure that your one-of-a-kind creation fits perfectly on your finger. It's important for us to know you are completely satisfied with your purchase before leaving the store. But if for any reason, you're not entirely happy with your jewellery item, you can return it in its original condition within 30 days. Each jewellery item will be inspected in order to receive a full refund. Please note, that delivery of your jewellery item is not included. Any cost on delivery will be deducted from the full amount. Another option will be to exchange your item for a creation, that's the same amount. Bespoke items and special finger sizing items you will not be able to return. Q: Is it safe to ship my diamond creation to another country? A: Of course. When it comes to our shipping services they're guaranteed to be safe and secure. For your peace of mind, each item is shipped with insurance. Please note, this service is only valid if your country allows for the shipment of diamonds to take place. Q: Do you offer door-to-door shipping? A: Yes, we do. However, this only applies if you provide us with a business address and not a residential address. Q: Will it be possible for someone else to sign for my purchase on my behalf? A: For the protection of the item we only allow the person, whose name is on the invoice to sign for the purchase. Other arrangements can be made if you send us a copy of your ID and give written permission for another individual to sign for your package. Q: Do you include VAT with shipping? A: VAT is included in local shipping (please, refer to South Africa Value Added Tax), but is excluded from international shipping. Q: How long do I have to wait for my purchase to arrive? A: It depends where you stay. For residents that live in main cities, shipping will typically take place overnight. Shipping to any outlying areas in South Africa will take 2 - 3 days and international shipment will usually take 8 - 10 days, depending on customs clearance. Kindly note, this does not include the lead times of your jewellery creations. Q: Do you charge extra for international shipping? A: If you're shipping to another country you need to pay for import duties and customs. Once this is paid, your item will be given to you. Please note, that all import fees are different so make sure to contact your customs office for more details. Q: If my fiancé prefers a different style ring to the one I chose, can I return it? A: You can return an item in its original condition, within 30 days from the date you purchased it. The return policy only applies to stock items and not bespoke items or items with special finger sizing. For your convenience, Shimansky offers local and international shipping of tanzanite and diamond jewellery. Each Shimanksy item is shipped with insurance for peace of mind. For your security, we only allow for shipping to take place during business hours. Please note, that a few countries might not allow shipping to take place due to internal complications. Kindly, make sure whether your country allows for shipping before purchasing an item. In addition, shipping does not include tax, VAT, customs duties and clearance, which will be charged to your account. We work closely with door-to-door couriers that we trust and will be happy to obtain a quotation for you from them. For residents in main cities, you can expect to receive your purchase the next day. Alternatively, your package will arrive within 2 - 3 days. If you live overseas, we will be happy to ship your item internationally. For more information feel free to contact us directly. A Shimansky representative will gladly guide you.